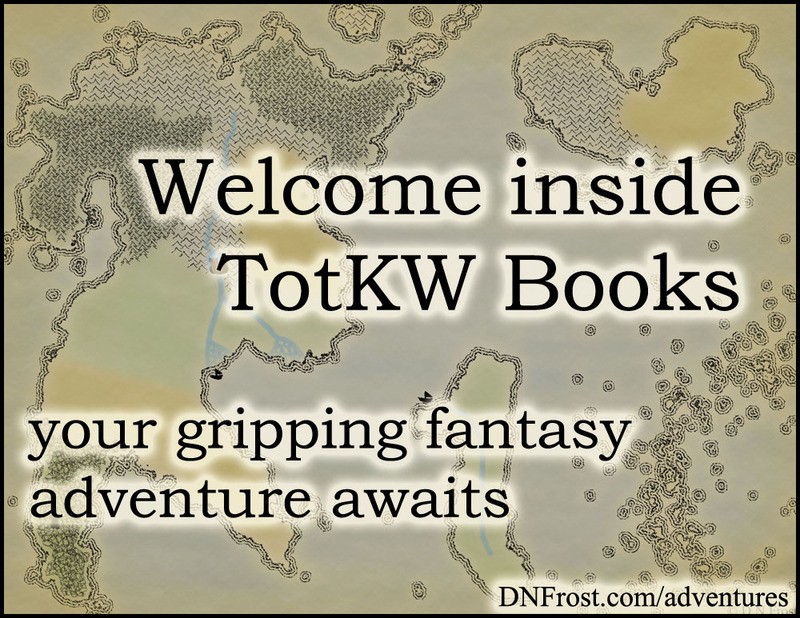 This post is Part 9 of a series to augment the Atlas of the Known World available for free download. Start with Part 1 here. Fertile river deltas in the elf heartland. You voted The Back Rishi winner of August 2015 by 56%. 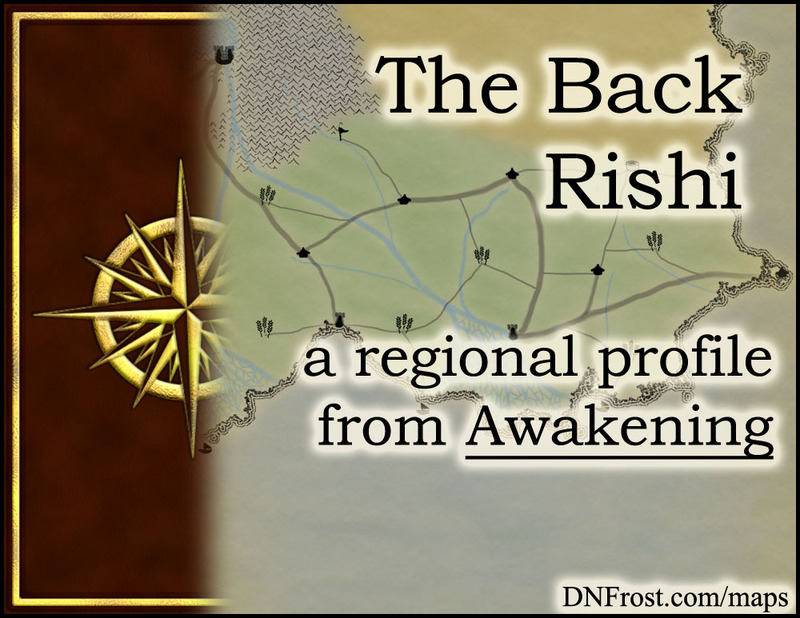 In Chapter 6 of Awakening, the Back Rishi forms the eastern half of the Plains of Rishi. It lies between the arid Sutek Desert to the north and the balmy Gulf of Lohki to the south. Below the sheer D'jed Mountains, its rolling plains foster mighty river deltas, where the rich black soil has been cultivated for centuries. At the western edge of the Katei Ocean, high escarpments plunge to meet the sea, and long growing seasons grace these temperate plains. This region also borders the Front Rishi, the Sren Shoals, and the Broken Hills. The Back Rishi is heavily agrarian, with little uncultivated land left. Hardy grains are grown in the drier soils north of the deltas, and rice paddies dominate the low-lying southern regions. Insects proliferate throughout the Back Rishi, supporting a wide array of birds and field rodents. The wild animals of the Back Rishi are smaller than their cousins of the western Front Rishi, and very few ranches exist east of the Black Ka river. Most farms have large chicken coops for eggs and poultry production, and many farms utilize domesticated wyverns to guard their fields from raiding insects or thieving trespassers. Oxen and horses are not uncommon beasts for plowing and transporting harvests to market. The plains elves of the sunny Back Rishi have browned skin and dark hair. Their long, backswept ears are similar to most other elves, but their dark complexions are unique amongst the elf races. While allied with the other regions of the Allanic Empire, the elves of the Back Rishi are more focused on their agrarian lifestyle than the doings of their neighbors. Women dress in simple frocks and men prefer to work the land in undyed coveralls. Colorful garments are considered feminine and gaudy, unless reserved for special occasions. In the southern regions of the Back Rishi, larger farms employ the lighter-complexioned tree elves as indentured servants, and the plains elves tend to look upon these pale cousins with disdain. Plains elves across the Rishi display similar magical propensities. Their elemental powers are profoundly weak, though in rare cases a plains elf may perform Earth or Air magic. Special magic is their typical strong suit, and plains elves make powerful Metal mages. Their Animal magic is a bit stronger than their mountain cousins, and plains elves display stronger Sound and Touch magics than other elf races. These sensory powers sometimes combine into the rare ability to perform Music magic, and wandering bards often earn a good living along the gulf coast. A hard-working, diligent people, the plains elves of the Back Rishi value thrift and re-purposing over new possessions. Magic is typically affiliated with the colors blue and purple, which evoke wisdom and harmony with the divine. However, magic is approached as a practical resource rather than an otherworldly inspiration. Education is freely available, and all are encouraged to increase their understanding of economics and ecology. Farms and counties are governed locally, deferring to imperial law when necessary, but the elves of the Back Rishi prefer to handle their own affairs. Families are matriarchal and less wealthy than those to the west, but they still manage finances with deft scrutiny. Farms are passed down through generations, usually without dividing the land amongst children. Uniquely slow to anger, Back Rishins lead informal lives and rarely take offense at the behavior of others. Age is measured in years, with the new year on the winter solstice as established by the ancient mer calendar. Birthdays in the Back Rishi are mild affairs celebrated with friends and family, a stark departure from the grand galas of the wealthier Front Rishins. Male children are not usually considered adults until they've taken a wife, and wedding parties double as coming-of-age ceremonies, with rituals confirming ascension to manhood often woven into the wedding itself. Women, however, become adults at first blood, and it is usually the woman who woos and proposes to her chosen man--once she's established a viable income for herself, typically as the inheritor of a piece of farmland. Mothers are expected to manage the farm's administrative duties in addition to raising children, while fathers are typically expected to labor on the farm and execute the harsher disciplinary actions for children and farmhands. While gryphon riders were traditionally the guardians of the Rishi, wild gryphons have completely vanished from the eastern plains. There are few policing forces in the heavily cultivated Back Rishi, and private farms often have their most established serving families act as local enforcers. These enforcers tend to live alongside the farmhands, or even double as farmhands themselves. They protect fields and prevent theft, from both raiding animals and desperate people. Some minor farms employ mercenary guards to protect their fields from thieves, but most small farmers have a few guard-wyverns and little else to protect their crops. Allanic is the uniting language of the empire, and the plains elves of the Back Rishi are no exception. Their dialect is a more tuneful and informal speech than the Allanic spoken further north in the empire. Compared to the elves of the western Rishi, Back Rishins speak more slowly and use a number of casual grammatical constructions that can sound lazy or disinterested to outsiders. Back Rishins, however, tend to gesticulate less than their western cousins do. The ancestral language of the elves, known as Ka'e, is no longer spoken in the Back Rishi, though traditional names and certain words still harken back to their ancestral roots. 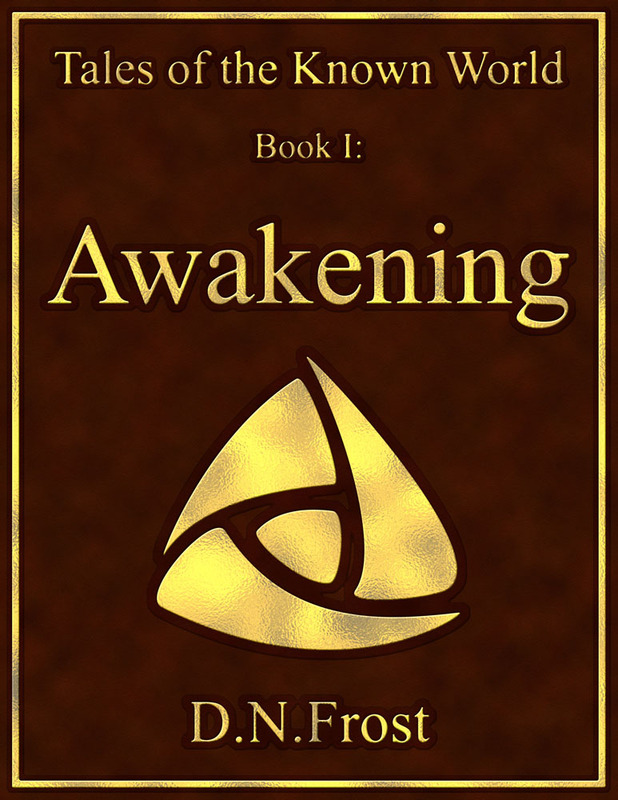 In the book Awakening, elves Sharis and Fal'on travel the Rishi Plains in the traditional nomadic lifestyle of gryphon riders, bartering their services for food and lodging. While flying above the Drylands near the Sutek, they encounter the desert rider Tirrok and his pegasus as they embark from the sands. After rendezvousing on the ground, Sharis and her brother share their knowledge about the plight of Allana's empress. Tirrok joins the elf siblings on their quest to seek help from the mages of the mythic A'lara City.